A YouTube video went viral over the past couple of weeks, capturing the heartwarming first moments after an extremely hearing impaired woman had a surgically implanted hearing device turned on for the first time. Sarah Churman, who recently turned 29, was severely hearing-impaired from birth. She had surgery a couple of months ago to implant an Esteem hearing device, which held the promise of bringing her virtually normal hearing. Then after an 8-week waiting period, the device was turned on, and her husband filmed her first reactions and uploaded the video to YouTube. This is an interesting Saturn return example, because it depicts the theme of important beginnings and endings in such a unique manner. Churman’s Saturn return is demarcating the end of her entire existence thus far as someone who cannot hear, and the beginning of a brand-new experience of hearing sound in the world. It also appears to be illustrating what is sometimes said of Saturn, that it lessens its burdens after the entire first cycle is completed. There have been a couple of references to her just having celebrated her 29th birthday, so it is extremely likely that she was born with both Mercury and Saturn in Libra, and possibly also with a retrograde Mercury, since Mercury was in Libra from August 28th through November 2nd in 1982, and was retrograde from September 19th through October 11th. This is interesting in regards to her hearing challenges, as one manifestation of Mercury together with Saturn can be communication obstacles. 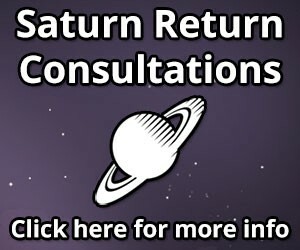 A lot of how Saturn transits in general as well as the Saturn return in particular will be experienced depends on the condition of Saturn in the exact timed birth chart, of course, which we don’t have here. But many people will have a mix of difficulties and successes, as in this example. The birth of a new child, family deaths, loss of property and general difficulties, capped off by removal of a major life obstacle. Not to mention that after her video went viral, she was invited onto The Ellen DeGeneres Show, where she was given a $30,000 check to pay back her mother-in-law for surgery expenses and told that she would be receiving the same surgery on her other ear for free! I wish a very happy congratulations to Sarah Churman on her newfound hearing abilities, and best wishes for the remaining year of her first Saturn return. I did send her an email asking if she’d be willing to share her birth data, but I never got a reply. So what I had to work with was her age plus several informal mentions of ‘best birthday present ever,’ or ‘going out to celebrate 29th birthday’ near the time of the video post.